Duke Thomas, a.k.a. the Signal, is back! 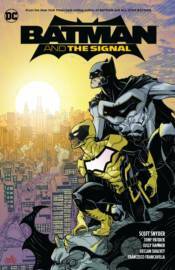 After months of training, the Signal is ready to step out of the shadow of the Bat to become a hero for Gotham City's daylight hours. But can he handle the challenge of Gnomon and his minions? And what key does Gnomon hold to Duke's past? Find out in these stories from the three-issue miniseries, plus backup stories from ALL-STAR BATMAN #1-4 and 6-9.